Searching for a quiet afternoon outside with an aerobic workout? 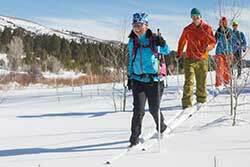 Then our cross country ski tours are your ticket into the outdoors. We offer a wide range of options to accommodate all levels of fitness, experience and interests. With over 75 kilometers of groomed Nordic trails in Park City and endless miles of touring options out in the Uinta Mountains, no two tours are the same. 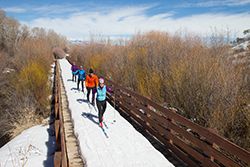 With so many different cross country ski options in and around Park City, having a local guide to help you narrow down the choices is a big plus. Let our Experts enhance your experience from start to finish with their knowledge of local trails, conditions, and history, as well as helpful tips on ski technique. With experience not only guiding, but often on the local race circuit, our Expert guides will help you get the most out of your day on the snow. Deciding where to cross country ski depends on a whole list of factors. Are you in the mood to tackle a few hills or would you rather just cruise along the flats? Do you prefer being close to town so that you can stop for an après coffee or does a day in the solitude of the wilderness sound more your style? 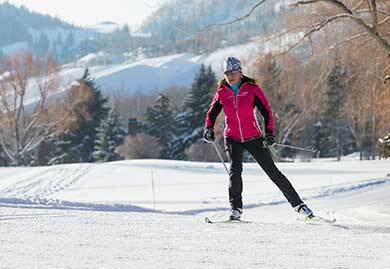 Do you prefer the traditional rhythm of classic skiing or the feeling of flying when you’re skate skiing? 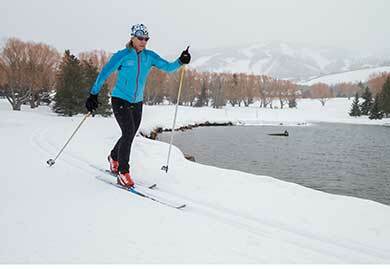 Let the Experts at the White Pine Nordic Center customize a tour just for you, so that you can relax and just have fun.